We understand that real independence means being able to drive what you want, when you want, so our Smart Transfer is designed to fit more than 300 different makes and models of vehicle – meaning it will transfer you safely in and out of the seat of your current car. Available in a range of sizes, the Smart Transfer can also be used in the home, on holiday or in the office. 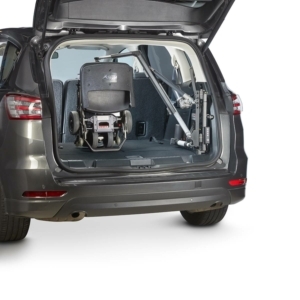 Capable of transferring you gently and safely from your wheelchair into the comfort of a standard car seat, the Smart Transfer person lift is the leading product of its type on the market because of its smooth operation and extraordinarily versatile design, which has seen us fit them in everything from a sports car to a mobile home. The Smart Transfer can even be used around the house or the office as a mobile person lift when used with the additional Smartbase. 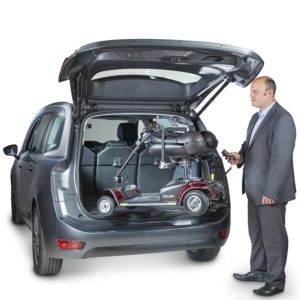 Whether you use a wheelchair, scooter or powerchair, our range of versatile Smart Lifter's will effortlessly lift it into the boot of your car at the start of your journey with just a push of a button. Thanks to smart engineering and clever design, our UK-built hoists can make light work of even the heaviest scooters, with our 200kg Smart Lifter – the most powerful hoist in the world - capable of lifting above the 150kg threshold. 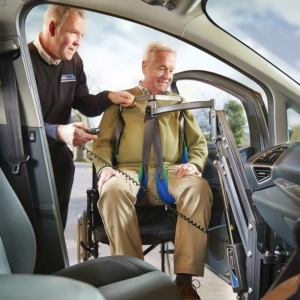 Autochair manufacture and fit an unparalleled range of supremely versatile hoists capable of lifting your mobility device effortlessly into the back of your current car, whether you drive a hatchback, estate, MPV or 4x4. 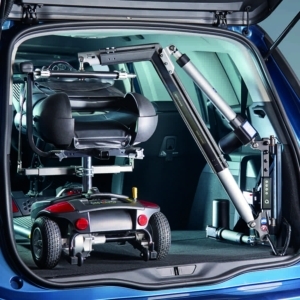 As long as the opening into the boot is large enough to take your scooter or powerchair, we have the product for you – from our 40kg Smart Lifter right up to our awesome 200kg Smart Lifter. If you require more information or advice on the Smart Lifter or the Transfer Hoist please feel free to call us on 0800 038 6839 or complete the below enquiry form to receive a free brochure.